A gas run pressure washer is usually more powerful than an electric pressure washer. 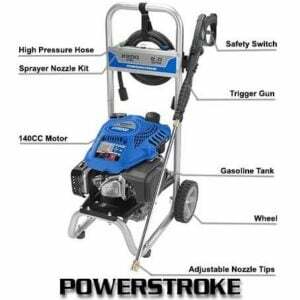 For your residential use Powerstroke PS80519B 2200 psi Gas Pressure Washer is one of the best models that are available in the market. Its powerful engine provides 2200 PSI of water pressure for cleaning the toughest stain easily and making your cars, RVs, motorcycle, deck, driveway, patio and many more things clean and shiny. With the sturdy aluminum pump, the device provides maximum water flow of 2.0 GPM. For user’s convenience, it has on-board storage for all its components. The two strong wheels make the movement of the machine easy and with the long handle you can pull it easily without bending. Before buying the product see all the features and the facilities you will get from this device. The purchase has satisfied almost all the users who bought this machine considering the facilities they are getting. 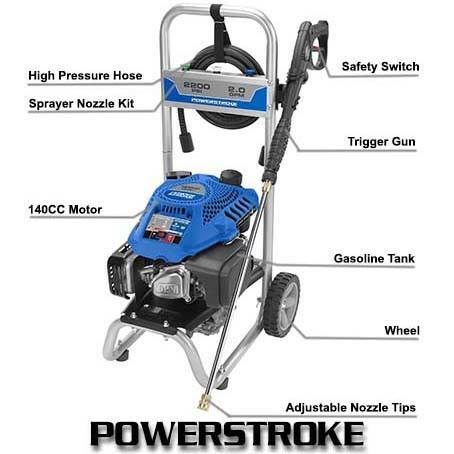 Powerstroke PS80519B 2200 psi Gas Pressure Washer has a 150cc powerful engine and an ultra compact frame. These components are pretty strong. The motor provides 2200 PSI of water pressure and the pump delivers 2.0 GPM of water flow. Aluminum Axial Cam Pump has been used in the device for convenient use and longer life. PWMA has certified the device that ensures the quality performance and efficient cleaning. Three quick connect nozzle tips 25-degree, 40-degree and a soap applicator nozzle tip are provided with the device. You will get a pro-style spray gun with the comfortable grip and a modern spray wand that can easily connect to the nozzle tips. There is a chrome plated 21-inch spray wand that has a quick connect nozzle coupler. With the device, you will get a 25-inch high-pressure hose for your extended reach while cleaning. There is a nice on-board storage for spray gun, hose, spray wand, and nozzles. With the strong 7 inch strong wheels you can easily move the machine to your cleaning area. The total weight of the device is about 60 pounds which is not much for moving the machine using the wheels. After assembling the dimension of the device becomes 34.7 x 17.25 x 19.25 inches. Its long handle makes it pretty easy to carry the device without bending your back. You will get two years of warranty. Powerful Engine: You will get a 150 cc OHV engine which will provide 2200 PSI water pressure and it is actually good enough for cleaning the home stuff. With Powerstroke PS80519B 2200 psi Gas Pressure Washer you are not going to feel that you needed a little more water pressure for doing the heavy duty cleaning. Now the time has come to clean all the dirt from home and make it look shiny. Durability: They used strong stainless steel to make the engine and an ultra compact frame has been used for its longer life. The Axial Cam Pump has an aluminum body which is pretty light and strong compared to metal. It has high-quality rubber and strong steel body so that it can give you uninterrupted service over a long period of time. Quick Connect Nozzles: For your different use you will get different nozzles that are 25-degree, 40-degree and low-pressure soap applicator nozzle. You can quickly connect the nozzles without any hassle to the top of the 21-inch spray wand and use as you like. You can connect your garden hose to the pump when you need to take the water to your garden or somewhere else. Warranty: The Company is going to provide two years of warranty for any of its manufacturing defects. This facility is going to secure your valuable investment. You can claim or replace your device if there is any problem. You can use cold water only which might be a little problem when you will go to clean oil, grease anything oily. Though the pressure will clean most of the dirt, it might not satisfy some of the users. You cannot adjust the pressure as you require. So the pressure will always be the same unless you use the soap applicator nozzle. In the present days, it is very difficult to choose a good pressure washer. It happens because you will find many options, many brands in the market. You have to check if the features are appropriate for your use. 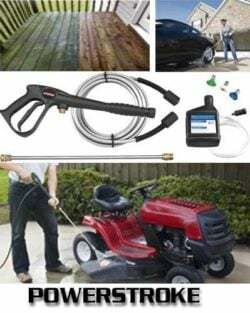 If you are going to use the device for the only residential purpose than Powerstroke PS80519B 2200 psi Gas Pressure Washer is one of the best pressure washers available in the market. The price that the Company is offering you for the machine is actually pretty less compared to the features and facilities you will get. It will be one of your wise decisions if you decide to buy this product. Click to Check Latest Price & Buy on Amazon.com, Now!